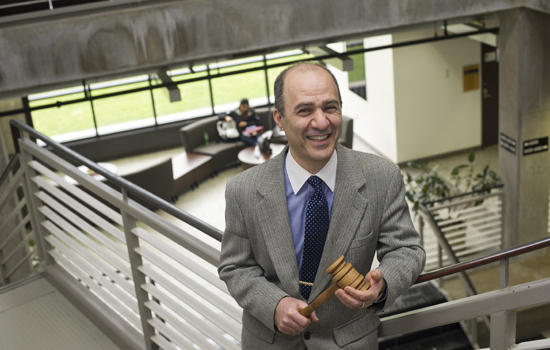 As head of Academic Senate, Hossein Shahmohamad has worked with his executive committee to engage faculty and give them a strong voice at RIT. What is the function and make up of Academic Senate? Shahmohamad: The Academic Senate is a diverse governing body that writes, reviews, and updates policies as well as receives reports regarding nearly all aspects of the operations of RIT. Formulation of recommendations relating to academic matters is the main function. The task of university governance is apportioned and delegated among the board of trustees, administration, faculty, staff and students of the university. The interdependence of these members of the university community and their delegated responsibilities establish the basis for effective shared governance. Among the 44 senators, there are deans, vice presidents, student representatives, staff representatives as well faculty members from all colleges. The exercise of the faculty’s role in academic decisions, the protection of legitimate faculty aspirations, the implementation and preservation of academic standards, and the promotion of the academic welfare of students are provided through academic governance in the Senate. How are representatives chosen to serve on Academic Senate? Shahmohamad: Each college gets one senator for the first 29 faculty members in their college and an additional one for every increment of 30 faculty members. Every college seeks nominations annually and then conducts elections. Each senator serves a 3-year term and can be re-elected for another term. No faculty member can serve more than six consecutive years. An alternate college senator is also selected to replace a senator in cases of absences or illnesses. What key issues has the Senate dealt with this academic year? Shahmohamad: A major item of discussion this year was the adoption of a new academic calendar. Other issues and policies making their way to the floor: adoption of armed guards on campus, Middle States Re-Accreditation Process report, Web Audit Update, Student Gender-Based and Sexual Misconduct Policy, Revised Proposal for Student Access to SRATE, and COACHE Survey Update. Since the theme of 2015-16 Senate was Shared Governance, presentations from each college on their internal governance structure were presented in the spirit of sharing best practices. The Senate Chair was invited to all colleges and spoke on the importance of shared governance. What key issues will the Senate likely take up next year? Shahmohamad: The first task of a newly elected executive committee will be to communicate with the RIT community and request charges and proposals. A slate of official charges for each standing committee is made. Unfinished charges from the previous year will be added to the list of charges for next year. How can faculty members engage with Academic Senate? Shahmohamad: Nominate yourself or someone else. It is often through writing and enforcing the appropriate policies that faculty can achieve higher levels of excellence for their students and programs as well improving values and qualities in many academic dimensions. Is there a website where people can get more information on Academic Senate? Shahmohamad: To see the Charter of Academic Governance, list of current senators in your college, read the minutes of past meetings, list of standing committees, as well as the current members of the RIT Academic Senate Executive Committee members, please visit rit.edu/academicsenate.